Tired of matching outfits and the Beatle Mania frenzy, they decided it was time for change and as a group; they decided they’d play their final live concert in San Francisco in August 1966. They now had the time and freedom they needed to record studio length albums and become artists vs. performers. Recorded mostly in spring 1967, the group recorded Sgt. Pepper’s Lonely Hearts Club, beginning with “When I’m Sixty-Four”. However, before they’d begun recording, Paul McCartney came up with the idea that they’d give themselves an alter ego as a group called Sgt. Pepper’s Lonely Hearts Club Band. Doing this helped the group create an album that was unlike anything they’d ever done and unlike anything their fans had ever heard. They didn’t know it, but they were about to make history as a band. One reason was that they discovered the act of multitracking. Multitracking is recording separate audio tracks and then combining them into a single audio track for mixing. On this album, the song “A Day in the Life” was the beginning of eight-track recording in Britain. The Beatles used two four-track machines at the same time for the orchestra overdubs. Sgt. 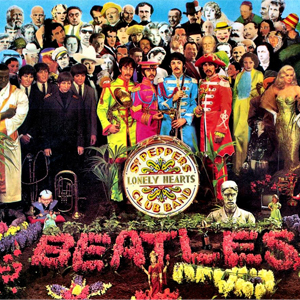 Pepper’s Lonely Hearts Club Band is an album that revolutionized the psychedelic era with its fearless experimentation of songs that painted bright pictures and ideas for its listeners. With George Martin as the bands producer and Geoff Emerick as the engineer, this album will forever be apart of BURL’s vinyl collection.